Six years ago, Aimee Fogg traveled to Belgium to learn about her great uncle’s death in World War II. Today, she has a new appreciation for life – and a growing collection of adopted relatives. Fogg, who lives in Gilford, has collected stories and photos of the 40 New Hampshire and 25 Vermont men buries in this cemetery and published them in a pair of books. She’s now documenting the accounts of 54 soldiers from Maine. Join us as she shares her story in a presentation scheduled for Wednesday, Nov. 8 at 6:30 p.m. in Taylor Community’s Woodside Building. This free event is open to the public. The men and women she now considers family share one thing in common: a loved one buried at Henri-Chapelle American Cemetery & Memorial. By the end of the war, it was the largest temporary American cemetery in Europe. 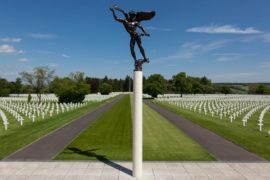 Many of the 17,000 soldiers have been returned to the U.S. for burial, but nearly 8,000 remain.